There is no other subject or field of knowledge which is looked down upon with such contempt, ridicule and scorn by the scientific world and rationalistic mind as the science of astrology. Is there a nucleus of truth in astrology or is it entirely a pseudo-science of the charlatans exploiting the gullible public? To answer this question, we have to examine the fundamental postulates of astrology with a deeper and broader scientific outlook and in the light of Sri Aurobindo’s insights. Before coming to the main theme of our discussion, we have to understand some facts about the origins of this ancient science of astrology. Whatever may be the present condition of astrology this field of knowledge was created by seers and sages who lived in the spiritual consciousness or by people who are able to perceive the deeper, inner and invisible truths and sources of nature, which the average human mind or the scientific and rational mind can not see or perceive. So if I deny their perception because I don’t have the faculties they had and can not see or feel what they were able to see or feel, I am like the cave dweller in the Plato’s story, who never saw the world outside the cave but deny the existence of Sun and Moon. Keeping these facts in our mind, let us now examine the basic postulates of astrology. We have to set aside the popular belief about astrology that planets determine our fate or destiny. This can not be the original conception of Indian astrology because according to Indian thought, our present state or destiny is the result of our past Karma, actions, and not that of planets. The stars in heaven do not determine our fate but only indicate it. For example, in palmistry, lines in our hands do not determine our fate but only indicate it. The Horoscope, which is a chart made on the basis of conjunction of planets during the date and time of our birth, gives an indication of the nature and course of life in this birth, not in a rigid form as in ineluctable fate, but as possibilities or to put it more precisely the most probable possibilities. This brings us to the question if out present fate is the result of our Karma how planets can indicate our Karma? The seer and sages of the world perceived an interconnected and interdependent unity as one of the fundamental laws of life. Everything in the world is connected together and influence each other. Our modern climatologists talk about the “butterfly effect” which means fluttering wings of a butterfly in a tree can create a storm in the ocean. The outer world is an expression of inner realities and forces and the movements of the visible world outside can be symbolic indicators of corresponding movement in the inner world. Our Karma is a bundle of psychological energies released by our past actions and its consequences. This Karmic energy or to be more specific, that part of our Karma we have to undergo in this birth, may have something like a butterfly effect on the planets, attracts a conjunction of planets with a corresponding psychological characteristics. What constitute the competence of a good astrologer? Expertise in traditional knowledge given in the old books is not enough. He must have a deeper intuition. An intuitive astrologer may make use of the traditional chart, computations and the rules as initial indicators. But he doesn’t depend entirely in them. With an intuitive comprehension, he assesses the net result or consequences of the various planetary combinations or conjunctions viewed not as material entities but as psychological forces. The second question is on the “use” of astrology. The answer to this question depends on the attributes, values and aims. For a seeker of truth, usefulness is of secondary importance. He seeks the truth for its own sake irrespective of whether it is useful or not. If he studies astrology, his aim is to know the truth behind it and not its “use”. In a higher spiritual perspective or in general, for the right conduct or management of life, astrology or knowing the future is not necessary. On the contrary, we are perhaps better without it. As many spiritual teachers have pointed out, to live in the present and dealing with life as it comes us, without caring for the past or the future is perhaps the most efficient and effective way of dealing with life. If we can add to it a perfect faith, trust and surrender to God, then we need nothing else to go through in life. However, there is also a pragmatic view-point which also has its validity. For example, when we are travelling to an unknown land, if we can know what are the difficulties or dangers which lie ahead in the various stages of our journey we are forewarned and prepare ourselves for it. Similarly, if astrology can give an understanding of the various possibilities which we are likely to encounter in different stages of our life, it heaps in our life-journey. As we have discussed earlier, our horoscope is not a chart of unalterable fate, but indicates life-possibilities, which can be altered by human will or invoking divine Grace. For example, if a planetary combination indicates the possibility of mental degradation at a stage in our life, we need not accept it as our fate and go mad! We can prevent it by making a conscious effort to bring inner peace, relaxation and greater self-control to our mind, inner detachment from our thought and feelings and praying for divine Grace. 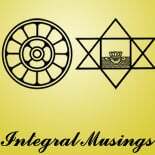 This entry was posted on December 31, 2018 by integralmusings in Society & Culture.